Sometimes one may need to adjust upper and lower limits of a variable. In this case it is necessary to utilize one control for each limit. However it could be more useful if two controls would have been integrated into one control. 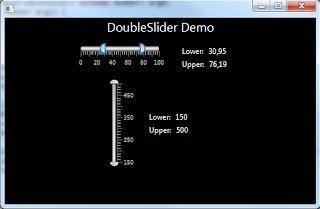 With this idea I’ve developed the DoubleSlider Control which has one thumb for each limit, by modifying the code for the Slider Control in OpenJFX project. It works with JavaFX 2.1. I haven’t implemented the keyboard bindings expect “Home” and “End”, because I couldn’t find an efficient way to handle them. The problem is that I couldn’t manage a thumb focused at a time. Hey this is nice! ControlsFX has a similar control but it requires semi-stable JFX8 development builds and that just isn't acceptable for deployment right now.